Skybet Championship. Kick-off 8pm, Wednesday 24th October. AFTER 4 straight wins in all competitions during late August/early September, Derby's results became as unpredictable as wonky shopping trolley. We've lost to teams we shouldn't, we've drawn against a few and we've also beaten teams that some most would argue ” how did that happen “. After another rude interruption to domestic football that is international football, Derby hit the ground running with a deserved 2-1 win at home to a Sheff Utd side that had won 4 on the bounce and were in 2nd place. Bryson got his 2nd in 2 games; notching in just 19 seconds – the fastest goal so far in the championship but was subbed early on 36 mins with an injury that will keep him out of tonight's game. Its a shame because he's started 11 of 12 league games for us and is starting to find the vein of form we know he's capable of. That substitution occurred right in the middle of a resurgent Sheff Utd's 20 minute spell that saw them register an equaliser. Nobody tracked the goal scorers late arrival into the box and he made it count. Lawrence came on for Bryson, Wilson switched to the middle and it seemed that Derby started that 2nd half by reclaiming the tempo of the game. At 1-1, Mount cleared a goal-bound header from a Sheff Utd corner and shortly after Marriot got his boot on the end of a Forsyth fizzing cross to get his 3rd goal in three games. It proved to be the Derby winner. I ummed and arred about dropping a £10 on Derby win/btts with the bookie en-route to my buddy's but forgot my bike lock so I never bothered. That was a 4/1 missed opportunity. Pre-match, I agreed with Mr F on the btts, we've forgotten how to keep clean sheets. But I also suggested a Derby double result should be another component of an acca, I think it only paid 4/9 but I did say the Derby win price with bet365 was generous @ 17/10. On we move to tonight minus Bryson. There isn't really much we can change so I doubt we'll make many, possibly change out a striker or maybe its the kind of game we need to shed a bit of midfield attack and add a bit of strength. West Brom are 3rd in the league and have won 5 on the bounce at home, so they'll feel their home advantage is a bit of a fortress. But they did suffer an away hiccup to Wigan going in to this match. Ex Derby ” Mr average defender ” Darren Moore did a great job lifting results for West Brom at the end of the season but couldn't avoid the trapdoor. Their team will be there or there abouts in the top 6 come May and I cannot help but think the 14/5 on offer with bet365 is worth a quid of anyone's money for a Derby win. Derby's results over 7 games are 2 wins, 3 draws, 2 losses. The win against Sheff Utd is a shot in the arm for a Derby side lacking in consistency but 5 points separate the top 6 and 8 points from top down to Villa in 16th. A couple of wins strung together and that league looks a hell of a lot different. I read somewhere that Derby had only lost 2 in all competitions in 12 matches. Just a shame we've only picked up 9 pts from 21 over the last 7 league matches. 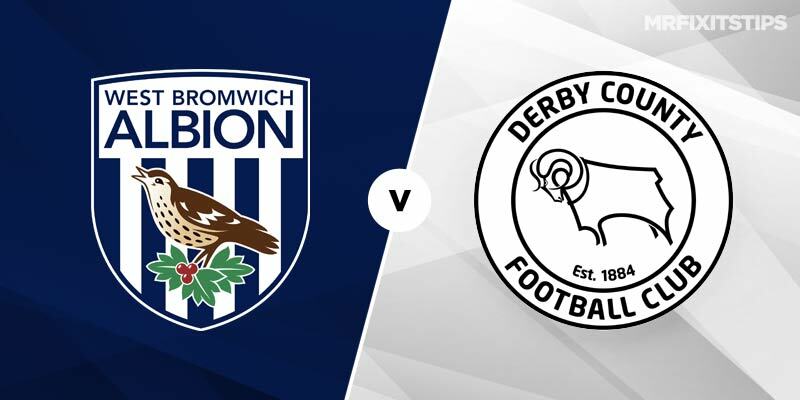 A pattern is starting to emerge in Derby's matches, so I will put up a ” safe ” tip and I'll also throw in a couple with a bit of meat on the bone – obviously riskier. Supremely confident the btts will land which opens up the feasibility of the 3rd and 4th riskier bet to deliver. 2 changes for the side that beat Sheff Utd, 1 is forced ( Bryson out and in comes Lawrence ), Malone returns to left back and Forsyth sits this one out. Aside from the Forsyth change, the shape, the players and the attack mindedness is the same as the Derby team that played out the last 55 minutes on Saturday. Wilson and Mount backing up the front 3 should be a recipe for goals. This game could be a high scoring goal fest, but Waghorn needs to up his Tally otherwise he’s in danger of being dropped. West Brom’s Jake Livermore is banned for 2 yellows in the last match and as has been pointed out in the main thread by another member, this match looks like it has cards in it. West Brom are playing a back 3 and I think if they do press us and we counter, Mount/Wilson/Marriot and Lawrence all have enough in the tank to create something quick and effective. A Rams point tonight would be good, but we’re away to Middlesbrough next, so 3 matches playing the top 3 on the trot, the shape/ideology and personnel on the pitch gives me confidence we can do a ram raid on them.